Mike Ullery | Miami Valley Today Piqua High School seniors Kamy and Kylie Trissell signed their letters of intent to play softball for Edison State Wednesday. From the left are father Dave Trissell, Kylie Trissell, Kam Trissell and mother Jenny Trissell. PIQUA —- Piqua softball opponents have been seeing double for the last four years. And opponents of Piqua High School seniors Kamy and Kylie Trissell, the daughters of Dave and Jenny Trissell, have been seeing that for a lot longer. On Wednesday in the PHS commons they made that the problem of Edison State Community College’s future opponents, signing to play softball for the Chargers. And they weren’t about to have that change. Piqua first-year softball coach Greg Campbell said Edison State is fortunate to be getting them. And the duo has made progress each year. Kamy, a centerfielder, had one double and two triples last year and already has 10 runs scored, seven hits, two doubles and seven RBIs this season. Kylie, a catcher, had two doubles a year ago and has seven runs scored, four hits and two RBIs already this season. And they feel like that progress will continue next year at Edison. Edison State softball coach Dan Cain knows exactly what he is getting. “I was able to coach both of them a few years ago in select ball,” Cain said. And what they bring, more than anything, is speed. Which will be “double trouble” for Edison State’s opponents the next two seasons. 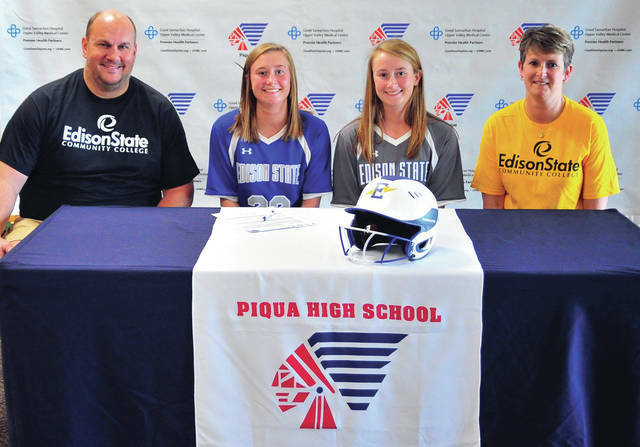 https://www.dailycall.com/wp-content/uploads/sites/30/2019/04/web1_041019mju_trissels.jpgMike Ullery | Miami Valley Today Piqua High School seniors Kamy and Kylie Trissell signed their letters of intent to play softball for Edison State Wednesday. From the left are father Dave Trissell, Kylie Trissell, Kam Trissell and mother Jenny Trissell.